"Best CRM in real estate!" Best in the business! User friendly and an excellent way to "work" a database! Set goals, manage transactions, keep tabs on clients in a very deep & relational way! Great "win the day" and "win the week" formulas! View your pipeline and potential business in an easy to use web-based CRM! I use it and highly recommend for any business owner! I would like to see a team version so that team members could have limited access to database, goals, transactions, and finances. If you're working by referral, you should seriously consider this CRM! My database is just a click away-phone app, tablet or computer! I like how simple it is to add to your database. I like how comprehensive you can make each client's profile. I like how it matches potential buyers to your listings. I like how it auto populates the best people to call and makes sure that no body gets missed. I like how it tracks everything for you. I wish it would autopopulate based on MRIS numbers and public records. I wish that you could easily print right from the system without exporting every time. I'd definitely recommend it. You don't need to be in the coaching program to use this great resource! Its top of the line as far as tracking and lead management goes. Keeping track of my business with lead and lag indicators. Helps with setting goals and seeing them accomplished. Keeps all of my data right in front of me and allows me to set up follow up appointments. In the end, I've received a number of referrals and have kept in touch with people who eventually became clients. "Possibly one of the BEST CRM's I have used"
keeping all of my contacts in one spot, being able to plan ahead my marketing. keeping my clients categorized is amazing and helpful. It allows me to know who is a cold lead and who is not. I like to work cold leads so this helps me to focus on just that. "A Complete CRM for Real Estate Professionals"
It 'prompts' you everything you need to do to be successful in your business! The simplest CRM and in a real sense, 'relationship management' system. Wish it was connected to my MLS - and I could send listings to my clients. However, there are many tools for that - and is useful only 'during' the transaction. ReferralMaker CRM - is a list of 'long term' relationship. Recently, I was doing my 'pop-bys'. My clients are all over Eastern Massachusetts - so it's a lot of driving for me. At one of the stops, I used the feature 'NEAR ME' to find out if I am missing any client a pop-by! Well, I was! I stopped by at this client's place and I have potential client for 2018! "This CRM is very visual to keep track of my activity and keeps me accountable of my progress." I love that this CRM is very powerful, but very simple to use. If you like accountability, especially with your Coach, this system is a winner. If you don't like accountability, use it anyway and challenge yourself! That's not easy to answer, so I dislike having to dislike anything on this CRM. The obvious action if you do not have a CRM, is to try the Buffini ReferralMaker. 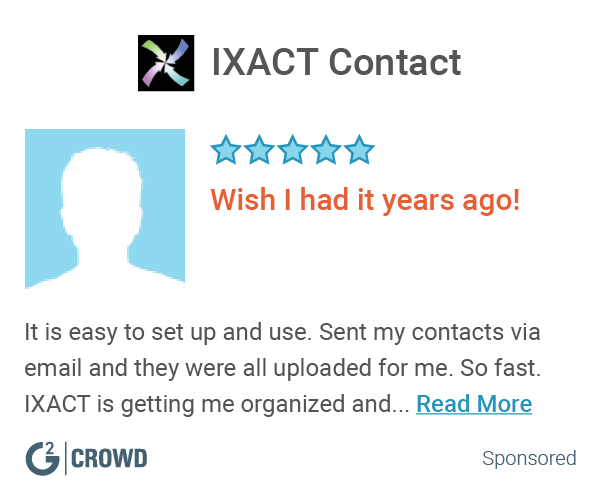 (There is a 30-day free trial and it is so easy to upload exisitng Contacts from other systems). Just starting to use the basic winning the day and week. Like I said, I like the visual part of this system and the 'Dashboard' shows my progress. As long as I keep up with my Daily activities, I know I will win the week. So, my business challenge is that simple, do the daily activities and it should build consistency. I'm just starting to be consistent. Ask me in three months how I am doing? "Intuitive product with a great companion phone app"
This CRM is customized to my industry. There are several available to me, but ReferralMaker is the best-priced and has the features I need to run a referral-based business. There isn't a feature that allows me to enter contacts that I don't want to market to, but want to keep their addresses handy. Contacts must be "graded" as to lead quality. It would be nice to have a separate "grade" for people like my family members who I want to keep mailing info for, but don't want to send marketing info to, without dumping them in the lowest lead quality grade. ReferralMaker tells me exactly who I need to contact and when. The mobile app tells me when I'm in the general vicinity of my clients so I can stop by their home or business. "ReferralMaker is a must have...short time on set up ~ easy to use & update ~ outlines daily WIN's!" easy to set up, ease of use, schedule your COMPLETE daily outline of What's Important Now...very SOLID platform! It take the guess work out of running your real estate business. Try it for 90 days and if you don't like it...you didn't work it! There is NO guess work left...the system outlines just about everything needed to hit your daily, weekly, monthly, and annual goals. Helps with accurate projection & fine tuning future business. Continually hammering the fundamentals and connecting deeper with the clients and so much more. "Broad use and user friendly"
Referral maker is a great CRM in itself, with the ability to keep track of clients, details, conversations, etc. But it's use is much broader than that. You can track real estate business goals, transactions, etc. If you're following Brian Buffini's principles, it's much easier to stick with this CRM. Cost is okay, but seems a little steep compared to other CRMs. It's a pretty closed system...not much ability to integrate with other resources and tools. When in doubt, this system lets you know that you need to get back in touch with your clients, and it's specific on which ones. It helps you realize when you really need to reach back out to someone. Referral Maker is so easy to use. It shows what interactions I’ve had with clients and suggests interactions if I haven’t touched base with them in a while. I love all of it. There are some great features that I didn’t know about until I worked with a coach. You won’t regret using it. The old CRM that I had was too confusing. This is very easy and straight to the point. I have been keeping in touch with my clients on a more consistent basis which willlead to more business. The ease of use on this website is outstanding. The website is so organized and easy to learn. They have so many tools to help with my daily activities. They always have very interesting items of value to send our clients. It schedules different forms of communication to our clients. It even tracks all our prospective clients and past sells along with commissions earned. Sometimes not all of the birthday activities generate. I find I have to double check these to not miss one. This maintains my boss's center of influence as well as current and past sales. It is a big way I keep organized day to day. I've used many CRMs and like many people I would be drawn to all a product could do and in that was the issue...too much. Referral Maker makes it easy...who to call, write and pop by to see each and every day based on my goals and my profile. Some outside vendors aren't integrated into this...YET. The company does a wonderful job of taking input, evaluating whether it is consistent with the working by referral goal, and if so does a top quality job before releasing it. RM solves the single most important question each and every day...what do I do today? "A must or Past Client follow up management"
If you are a Buffini believer, this is a must have! It is a great database manager, and it follows the methods that Buffini preaches. It also has all of the other features of Buffini and Co built in so it is easy to send out IOV straight to your people. There are a few features that I do use and kind of get in the way. Because there are so many things I could add to each contact, I waste time sifting through the ones I do not want to fill out. Keeping in touch with all leads and past clients thereby increasing my chance of these clients referring business my way. "Best Client follow up CRM"
Business management of day to day task to needed to achieve goals and quick transaction and income flow charting. Enhances the ability to work by referral. It is not set up to handle a team of agents. If you want to build a referral based business you should try this software. Tracking and monitoring to improve performance. "Very easy to use but does what I need it to do"
Ease of use, keeps my goals in front on me all the time. Tells me what needs to be done to achieve my goals. Give it a try, I know you will like it. "Brian Buffini Referral Maker "
Keeps me on track and timely. Super easy to navigate. I love the mobile app very much as well. So nice to know where I stand as to referrals and follow up in one easy glance. Highly recommend Referral Maker! Keeps me just a little bit uncomfortable which is a good thing really! Follow up and tracking. One of the greatest benefits is the tracking. So much more systematized and easy to follow. I like that is is easy to use, but complex enough to do what you need. Campaigns are a little challenging to use, but all in all I am happy with them. "Great CRM! Not for the Beginner"
It isn't exactly user friendly. The learning curve is long. Take the time to learn how to use this product. It's definitely worth your time and effort. It organizes my client database very well. This product not only allows me to organize my contacts by category, but it allows me to automatically know who needs to be called, sent notes, have a meeting with and much more! Any issues I have had are resolved through support or upgrades to the program. "Great product user friendly "
The business tracking (income and expenses) and deals completed, pending and active. The "marketing e-mail and letter" editor is cumbersome, but it gets the job done. Be prepared to use it on a daily basis ... don't try to "catch up" on the tasks and the tracking. Referral Maker is great when you are trying to keep track of who you have spoken with and reminders to contact them again. The importing process sometimes messes up, and whenever you edit anything there is a save button you have to scroll down to click. I am able to get through my prospecting and determine who should be called next. "A great CRM for Realtors"
I like how my clients are categorized. I know who to call and when. I'd like to see a task list added for each transaction. I'm able to.prioritize my calls for maximum efficiency. It is really easy to use, interface is very pleasant. There is really nothing to dislike about it. "Great for experienced agents "
Some features aren’t needed/it’s too much for some agents to use. I wouldn’t recommend for new agents. "Referral Maker is easy to use, comprehensive, and in minutes each day can help you achieve your goal"
Seeing my active, closed and the business in my pipeline! Designed with your needs in mind. Expertly crafted to increase your sales! "So Conveinant and Easy to use"
The organization of clients is spot on. IOV is always timed perfectly. Sometimes clients get switched around or doubled up. Constant approach on what contacts I make & what new contact it creates!!! No dislikes of the program except my remembering to enter it all. Remembering to reach out to ALL of my database! Which has resulted in multiple referrals. * We monitor all ReferralMaker reviews to prevent fraudulent reviews and keep review quality high. We do not post reviews by company employees or direct competitors. Validated reviews require the user to submit a screenshot of the product containing their user ID, in order to verify a user is an actual user of the product. Hi there! Are you looking to implement a solution like ReferralMaker?